Changes in near surface air temperature (ΔT) in response to anthropogenic greenhouse gas forcing are expected to show spatial heterogeneity because energy and moisture fluxes are modulated by features of the landscape that are also heterogeneous at these spatial scales. Detecting statistically meaningful heterogeneity requires a combination of high spatial resolution and a large number of simulations. To investigate spatial variability of projected ΔT, we generated regional, high-resolution (25-km horizontal), large ensemble (100 members per year), climate simulations of western United States (US) for the periods 1985–2014 and 2030–2059, the latter with atmospheric constituent concentrations from the Representative Concentration Pathway 4.5. Using the large ensemble, 95 % confidence interval sizes for grid-cell-scale temperature responses were on the order of 0.1 °C, compared to 1 °C from a single ensemble member only. In both winter and spring, the snow-albedo feedback statistically explains roughly half of the spatial variability in ΔT. Simulated decreases in albedo exceed 0.1 in places, with rates of change in T per 0.1 decrease in albedo ranging from 0.3 to 1.4 °C. In summer, ΔT pattern in the northwest US is correlated with the pattern of decreasing precipitation. In all seasons, changing lapse rates in the low-to-middle troposphere may account for up to 0.2 °C differences in warming across the western US. Near the coast, a major control of spatial variation is the differential warming between sea and land. The online version of this article (doi: 10.1007/s00382-016-3200-x) contains supplementary material, which is available to authorized users. The work was supported in part by the U.S. Department of Agriculture, National Institute of Food and Agriculture (USDA-NIFA), via the Regional Approaches to Climate Change—Pacific Northwest Agriculture (REACCH PNA, USDA-NIFA Grant 2011068002-30191) project and USDA-NIFA Grant 2013-67003-20652, and Sihan Li was funded through a Department of the Interior Northwest Climate Science Center graduate fellowship. 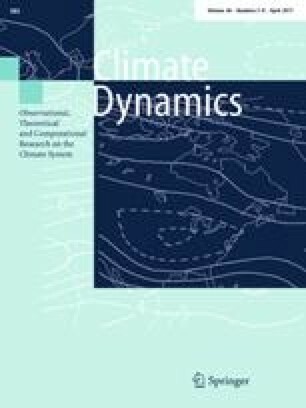 The authors thank Andy Bowery, Friederike Otto, and the entire team at Weather@home for their assistance and the thousands of volunteers who supplied computing power for this study, and also thank Richard Betts from the UK Met Office Hadley Centre and William Ingram from the University of Oxford for their expert consultation. Weather@home uses The Berkeley Open Infrastructure for Network Computing (BOINC), which is supported by the National Science Foundation through awards SCI-0221529, SCI-0438443, SCI-0506411, PHY/0555655, and OCI-0721124. The data used for this paper are available by request from the corresponding author. SSTs for the future period were created by adding a change (Δ) in SST to the observed SST in the OSTIA data. The OSTIA data are provided at a 1/20°-resolution so are first regridded to the N96 grid used in HadAM3P. SSTs from the CMIP5 historical experiment (1850–2005) were concatenated with those from the CMIP5 RCP 4.5 experiment (2006–2100). Three-dimensional arrays X i (latitude, longitude, time) of monthly SST were generated for the period 1900–2099 for each calendar month i: a total of 12 arrays. X i for each i was temporally smoothed using a Gaussian filter along a moving window of 31 years. The standard deviation of weights was scaled to the size the window and was ~5.6 years. ΔSSTs were calculated by subtracting the smoothed SSTs for the period December 1985 to November 2014 from the smoothed SSTs for the period December 2030 to November 2059 (e.g. December 2030 minus December 1985). ΔSSTs were regridded to the N96 grid used in HadAM3P. ΔSSTs were interpolated over land to avoid coastline mismatch between HadAM3P and the CMIP5 GCM, and the HadAM3P land mask was applied. ΔSSTs were spatially smoothed using a Gaussian filter. ΔSSTs were added to the regridded OSTIA SSTs for the period December 1985 to November 2014 to derive SSTs for the period December 2030 to November 2059. The strength of Weather@home is its ability to generate very large ensemble of short runs (e.g. 1-year long) relatively quickly. A compromise for this strength is that runs of many consecutive years (as typically done during spin-up) are cumbersome. The spin-up procedure described below arose out of a need to balance available resources with efficacy while operating within the Weather@home structure; in other words, to avoid continuous, multi-decadal spin-up runs. For the historical scenario, the spin-up began with an existing single 10-year long continuous simulation ending in 1967.11 (see Massey et al. 2014). The final model state from this run, saved in a “restart” file, was then used to provide the initial conditions for each of 28 single-year runs beginning in December of the years 1985 through 2012 and ending November 1986 through 2013. Next, the restart files from each of these 28 simulations were used as the initial conditions of single-year simulations beginning in December of the years 1986–2013. The restart file from 1986.11 was used to initialize 1985.12 because there was no simulation ending in 1985.11. For the future, a historical run, spun-up using the above method, seeded the spin-up procedure: a restart file from 2011.11 was used to initialize single-year simulations beginning 2030.12, 2035.12, 2040.12, 2045.12, 2050.12, and 2055.12. Next, the restart files for each of these 6 runs initialized at least four single-year runs in consecutive years. For example, the restart file from 2031.11 initialized 2030.12, 2031.12, 2032.12, 2033.12, 2034.12, and 2035.12, while the 2036.11 restart file initialized 2036.12, 2037.12, 2038.12, 2039.12, and 2040.12. Lastly, the restart files from each of these 28 simulations ending in 2030.11 through 2057.11 were used as the initial conditions of single-year simulations beginning in December of the years 2031–2057. The new restart file from 2031.11 was also used to initialize 2030.12 because there was no simulation ending in 2030.11. In summary, each modeled year in the future scenario underwent 15 years of spin-up, of which the last 3 spin-up years were driven by the forcings and boundary conditions of the year’s respective time period under RCP 4.5.